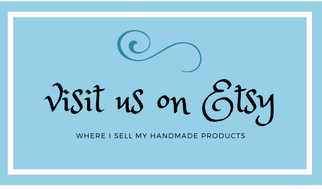 I have been visiting around blogland a bit and have noticed all the fall decor that is starting to show up. I am still putting mine together - a bit slow this year and have nothing new ready yet so thought I would show you my mantel from last year before I show you this year's mantel. Last year's mantel was before we added the faux pallet accent to the wall above the fireplace. I liked my book page wreath there but it did blend into the color of the wall a bit and didn't stand out as well as I would have liked. 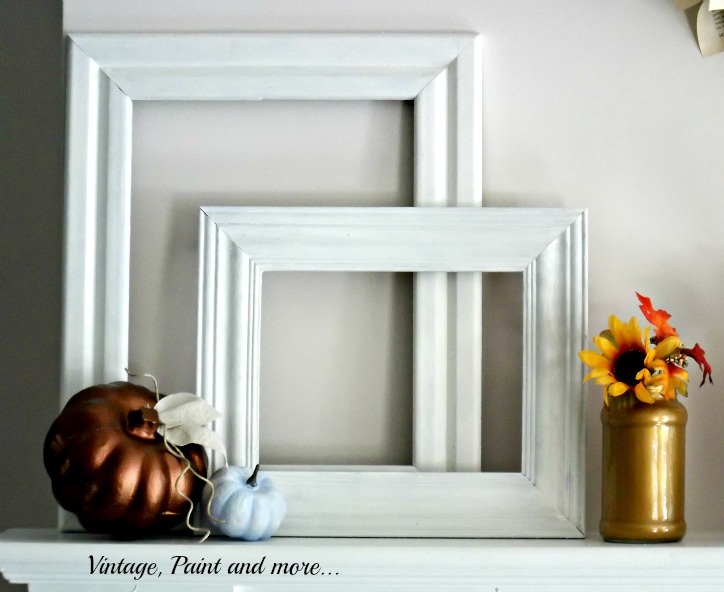 I had painted some old frames with white paint and then added metallic touches in the pumpkins and in some old jars I had saved and painted using the technique I used here. 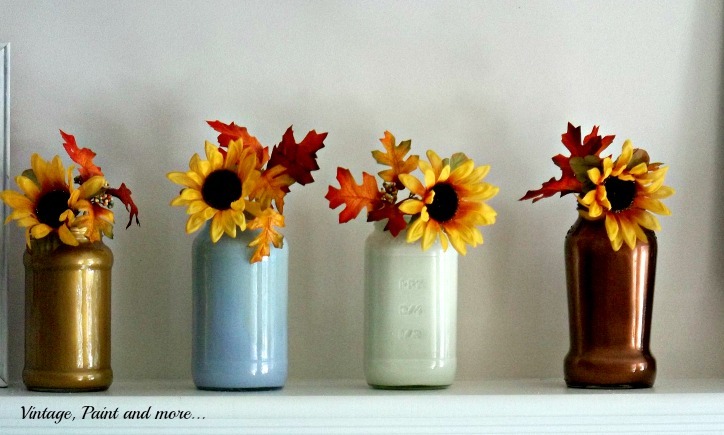 I then added some sunflowers and fall leaves to contrast with the colors of the jars. I also added a gold frame and painted a pumpkin blue to bring in the primary color of our living room. I really liked this mantel a lot - the simplicity of it, the fact that I used metallics along with blue and white, and the bright sunflowers. This year I decided I wanted to go a bit more traditional on my decor and colors. However I feel that some of last years touches are slowly winding their way back into this years design. We shall see what I finally come up with next week. So far I am really loving what is coming together. 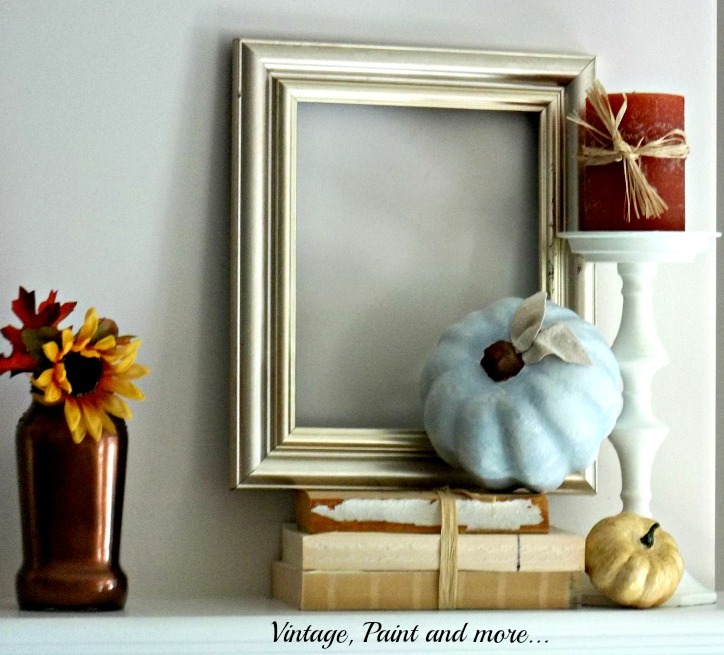 Have you started your fall decor yet? Are you going with your usual or are you going completely against what you usually do? Tell me about it in the comments below. I answer all comments through email. Love to hear from you. I will be linking to the parties listed on my I Party At page. 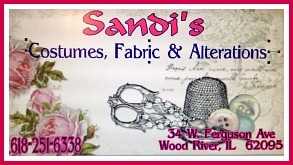 Please go visit them and see all the great projects and inspiration found there. I'm way too lazy for fall decor. I'm lucky if I get the holiday stuff up. Looks great! Like Twinkle above it's been too hot here to get motivated for decorating. Perhaps I'll get to it in a few weeks. 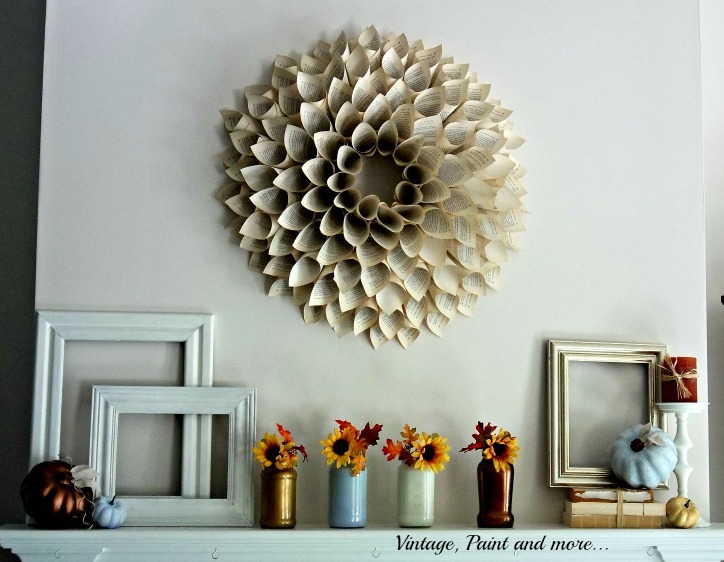 Love the book page wreath! i have always wanted to make one but can't seem to find the time..... I did just make 10 wreaths for a Craft Fair that i am doing next weekend!! I just love your book page wreath. I don't do any fall decor because we just don't get fall weather. It feels like summer almost until Halloween so I keep my summer mantel up. Oh, I really like this. You have a great eye for the little things...and bringing it all together. Beautiful mantle.